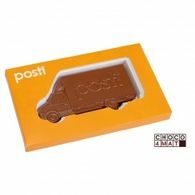 A whopping 94% of consumers will remember the name of the brand that they receive promotional gifts from - this can be your business. 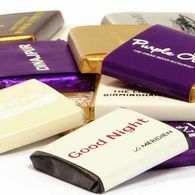 So if you're heading to a networking event or imporant conference and want to make a stand out impression, promotional chocolates can do just that! 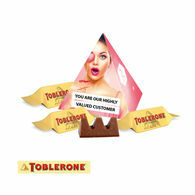 Customise your selection of corporate chocolates with your company logo, colours and message so you can stand out from the crowd and grab the attention of potentional customers or gift to loyal clients as a thankyou for their continuing support. 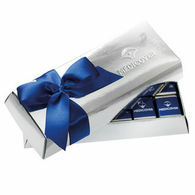 Corporate chocolate can be given any time of the year, so if you're looking to gift branded chocolate, particularly around the Easter holiday, we have a range of products suitable for this time of year. 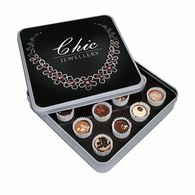 Our chocolate gift boxes are great for gifting to individuals or sharing in the office, choose from a variety of packaging options from small to large which are convenient for placing on tables or giving out individually. 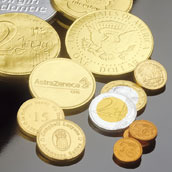 If you're looking for branded chocolate with a little something extra, we have a fantastic range of chocolate coins, chocolate lollipops, chocolate footballs and chocolate telegrams. 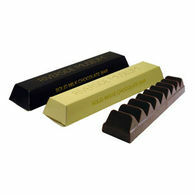 For something even more luxurious, choose from a selection of the finest chocolates from the best chocolatiers in Europe such as Leonidas, Lindt, Milka, Toblerone and Noble. 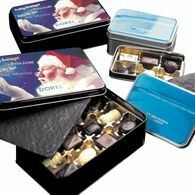 With a range of options available, we can provide you with highly personalised chocolate gifts that showcase your company logo and colours wrappers, boxes or even on the chocolates themselves, these not only look great, but also taste great too!